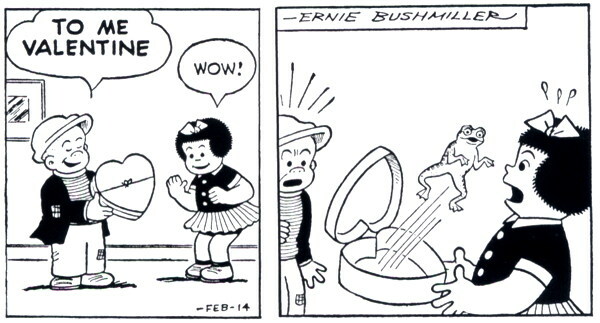 Happy Valentine’s Day from Nancy and Sluggo! Because I didn’t give you the first half of the strip, where Sluggo obtains a candy box from a friend of his without looking inside first. That’s Our Sluggo! Ah, so it’s a double Valentine’s Day prank! Also, I can’t stop picturing a bald Sluggo in a wheelchair saying, “To me, my valentine!” a la Professor X.